The liver's job is to rid the body of toxins and waste that can make us sick. But every once in a while, the liver itself needs to be detoxified as well and Total Cleanse Liver Fat Formula from Solaray can help. Solaray's Total Cleanse Liver Fat Formula contains milk thistle, artichoke and Japanese knotweed, three herbs known for their cleansing properties. 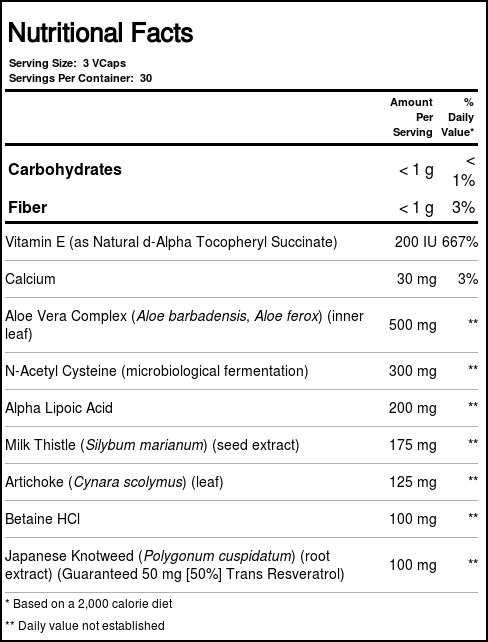 This formula also has alpha lipoic acid (ALA) and cysteine, an amino acid, for more liver support. Aloe vera and vitamin E promote healing and support the tissue health of this vital organ. Total Cleanse Liver Fat Formula from Solaray can be taken three times a day for two weeks for best cleansing results. Try it today at eVitamins! 推荐用法: Take 3 vegetarian capsules up to two times daily with at least 8 ounces of water or juice. For best results, this product should be used for a two-week cleansing period.